Racing on the Kentucky circuit won’t skip a beat after Keeneland plays host to the two-day Breeders’ Cup World Championships on Friday, Oct. 30 and Saturday, Oct. 31. Churchill Downs Racetrack will open its 126th Fall Meet on Sunday, Nov. 1 with a 10-race program at 12:40 p.m. (all times Eastern). The popular 21-day stand, which covers a four-week stretch through Sunday, Nov. 29, kicks off in style Sunday with the 11th annual “Stars of Tomorrow I” program, which is entirely devoted to hopeful 2-year-old stars that have aspirations of trail-blazing their way to next year’s Kentucky Derby Presented by Yum! Brands and Longines Kentucky Oaks. The 10-race opening day card is headlined by a pair of one-mile, $80,000-added overnight stakes – the open-company Street Sense (Race 8 at 4:15 p.m.) and Rags to Riches for fillies (Race 9 at 4:45 p.m.). Both races serve as local steppingstones to the pair of Grade II, $200,000, 1 1/16-mile counterparts on the Saturday, Nov. 28 “Stars of Tomorrow II” program – the open Kentucky Jockey Club (GII) and Golden Rod (GII) for fillies that are part of the Road to the Kentucky Derby and Kentucky Oaks series which award points to the Top 4 finishers (10-4-2-1). A total of 130 juveniles were entered to compete on Sunday – 113 in the body of the races, which would be an average 11.3 horses per race, and another 17 also-eligible runners in the event of scratches. Express Thoroughbreds LLC’s Discreetness, an 8 ½-length first-level allowance/optional claiming race winner over seven furlongs at Churchill Downs during the September Meet for trainer “Jinks” Fires, is among the 11 colts entered in the third running of the Street Sense. The field from the rail out (with jockeys): Mo Tom (Corey Lanerie), Cotton Town (Ricardo Santana Jr.), Discreetness (Jon Court), My Majestic Flight (Joe Johnson), Shogood (Chris Emigh), Tom’s Ready (Brian Hernandez Jr.), Huntin’theholidays (Willie Martinez), Siding Spring (Shaun Bridgmohan), Pinnacle Peak (Florent Geroux), Uncle Brennie (Chris Landeros) and Junkers (Leandro Goncalves). Siding Spring and Tom’s Ready are on the also-eligible list for Saturday’s Breeders’ Cup Juvenile (GI) at Keeneland. In the Rags to Riches, Mike Rutherford’s impressive homebred Keeneland maiden-winner Stageplay from the Steve Asmussen barn will face Pocahontas (GII) runner-up Dream Dance and 12 others. The field: Family Tree (Shaun Bridgmohan), Dream Dance (Brian Hernandez Jr.), Lady Day Blues (Corey Lanerie), Vieja Luna (Juan Leyva), Little Cherie (Julien Leparoux), Arraign (Florent Geroux), Royal Story (Robby Albarado), Banree (Albin Jimenez), Covey Trace (Joe Rocco Jr.), Scatmeifucan (Miguel Mena), Inconclusive (Jose Valdivia Jr.), Sensuous Pat (Calvin Borel), Stageplay (Ricardo Santana Jr.) and Put Da Blame On Me (Paco Lopez). The first race on Sunday and every day except Thanksgiving Day is 12:40 p.m. (gates open at 11:30 a.m.). Sunday’s National Weather Service forecast for Louisville calls for cloudy skies with a high near 68 and 40 percent chance of showers. Over the course of the meet, horsemen will have ample opportunities to uncork promising juveniles or seek year-end graded-stakes glory. All told, 13 stakes races cumulatively worth $2.12 million – which includes a quartet of overnight stakes – will be run during the fall stand. Meanwhile, bettors are certain to be challenged by the competitive Fall Meet racing that typically pits the fastest and battle-tested horses against the recently freshened year-end bloomers. With a compact 21-day schedule and not as many competing race meets at year’s end, the Fall Meet traditionally offers larger fields. Last fall, the average field size was 8.56 horses per race compared to the 7.79 and 7.96 at this year’s Spring and September meets, respectively. The horses this fall will be vying for more prize money, too, as more than $10.3 million is eligible to be paid. A year ago, the average daily purses distributed was $359,081, and an average of $492,000 is being offered daily in the condition book this year. The anchor of the lucrative stakes program comes on “Black Friday,” Nov. 27 with the 141st running of the $500,000 Clark Handicap Presented by Norton Healthcare (Grade I). The 1 1/8-mile test for 3-year-olds and up annually lures some of the top older horses in North America and is one of seven stakes events cumulatively worth $1.38 million to be contested over Thanksgiving weekend. The Bob Baffert-trained Dortmund is among the early possible starters. After Sunday’s opener, live racing will be conducted on a Wednesday-Sunday schedule with dark days on Mondays and Tuesdays. Most race days feature 10 live races, but there will be 11 on Saturdays and 12-race cards over the final four days, Nov. 26-29. The only special post time of the Fall Meet is an 11:30 a.m. start on Thanksgiving Day – a Louisville tradition at Churchill Downs since 1969 where more than 7,000 turkey dinners are served with all the trimmings, making it the largest number anywhere in the region. Admission gates open that day at 10 a.m.
Other special events throughout the Fall Meet include Family Adventure Day Presented by Kroger on Sunday, Nov. 8; Military Appreciation Day with free admission for active and retired members of the U.S. armed services on Wednesday, Nov. 11; Senior Days with a discounted Millionaires Row offer for age 60 and up on Thursday, Nov. 5 and Wednesday, Nov. 18; “Who’s the Champ?” Handicapping Contests on Sundays, Nov. 8, 15 and 22; and a 2016 Churchill Downs Wall Calendar giveaway to the first 5,000 in attendance on Sunday, Nov. 29 (closing day), courtesy of Humana. Corey Lanerie, who rode 36 winners a year, seeks to defend his Fall Meet riding title. He recently was leading rider at the Keeneland Fall Meet and has won nine of the last 10 riding titles at Churchill Downs. Dale Romans was last fall’s leading trainer and has 13 titles overall at his hometown track. Ken and Sarah Ramsey and Gary and Mary West shared the crown for leading owner with 12 wins apiece. The Ramseys are Churchill Downs’ all-time leading owners and seek their record-extending 25th meet title. 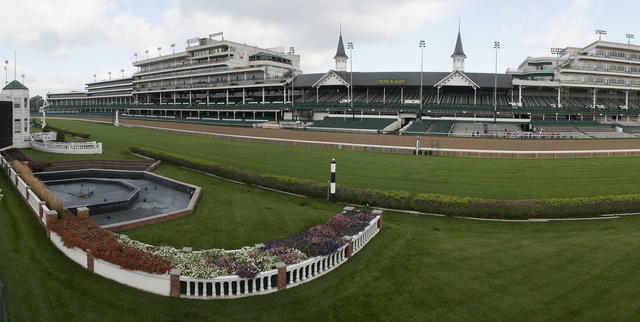 For the most part, the betting menu will be the same as recent meets, but Churchill Downs will offer a new wrinkle to its Pick 6 and put its Lucky 7 Jackpot on hiatus. Instead, a 20-cent minimum “Single 6 Jackpot” will be offered on the last six races each with a low 15-percent takeout. The Single 6 Jackpot will be paid out only if there is a single winning wager with six winners placed at the required minimum bet value. If there are multiple winning wagers with six winners in the six-race sequence, 90 percent of the net money wagering into the pool will be paid out, and the remaining 10 percent will carry to the Single 6 Jackpot. If there are no tickets will all six winners, 100 percent of the pool will carry to the Single 6 Jackpot. There will be a mandatory payout on closing day. Also, the first pools of the 2016 Kentucky Derby Future Wager will be offered Nov. 26-29. The traditional pool with 23 individual wagering interests and an “all others” option will return, but track officials plan to debut the new Kentucky Derby Sire Future Wager as well, in which bettors can wager on the winning sire for next year’s Kentucky Derby winner. Much like the KDFW, there be 23 individual sires offered with an “all others” option, which means bettors will have multiple progeny to support. General admission to Churchill Downs is $3 ($10 on Thanksgiving Day). Reserved box seats are $10 ($25 for Thanksgiving); indoor dining options are $37 ($55 for Thanksgiving Day; $45 for Nov. 27-29). Children 12 and under are admitted free when accompanied by an adult, and admission for seniors age 60 and up is $1 (except Thanksgiving). Free seating is available over a first-come, first-serve basis in Sections 113-117. Parking is free in the Longfield Avenue lot (Gates 10 & 12) and valet parking is $10. Tickets can be purchased online at ChurchillDowns.com/Tickets, in person at the Gate 1 box office or by calling (502) 636-4400. Travis Stone will describe the racing action with Joe Kristufek serving as a paddock analyst.